CARL RUSSO/staff photo. 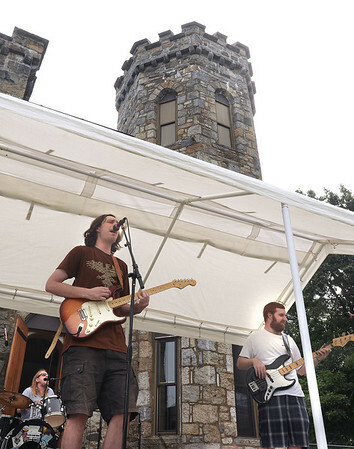 The Newburyport band, Eagle In The Attic perform with the castle towering behind them. They are Randy Robinson, left on Guitar, Bill Sullivan on Bass and Chris Hall on drums. The Steve Lyons Fund hosted the annual Rock Out! Cookout on Saturday, August 25, at Winnekenni Castle in Haverhill. This family-friendly afternoon of music, food and fun benefited the Haverhill High School Marching Band Uniform Fund. The music included performers from Be Imagine Music Studio and DeAngelis School of Rock as well as a host of local performers.